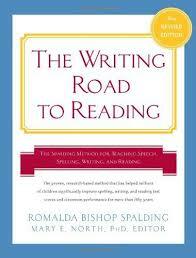 Our reading program is based in the Writing Road to Reading which uses the Spalding Method. The Spalding Method is based on a systematic approach to phonics. These letter sounds are learned as children learn to write their letters. In Kindergarten and 1st grade (our PrePrimary class), they begin with manuscript writing and also learn to read all of the different forms of a letter. The phonics program is reviewed in the second grade, when as the students learn cursive handwriting, they review the 70 phonographs associated with English. Additional prefixes and suffixes are added and words become multi-syllabic. Vocabulary builds from the literature books that the children read. The Writing Road to Reading requires the use of leveled readers in addition to their teacher guided learning efforts. In our Preprimary class, we use the developmental readers from BOB Books. These short booklets are an easy accomplishment for our students and help them to build confidence in their reading. These books are supplemented with Usbourne readers and Scholastic readers. We continue to use the Writing Road to Reading as our main tool for teaching reading and the major types of written material. Beginning in second grade, the students review their understanding of phonograms but now they do so as they learn to write cursive. Thus our students learn a rapid way of writing and to read such writing along with regular reading skills. They do not use readers but now use books associated with our theme units! We do not let them drop their refining of reading for understanding. We use the SRA self-directed materials to encourage them to continue to read to understand materials and to see how their understanding improves as they learn to read harder material and as they also learn to read faster. Our teacher guided sessions continue to be a time of reading out loud and our centers time continue to include a time to be read to as a whole group. Some of our theme units will have a "reader's theater" as a final deliverable! Developing our children's reading ability continues explicitly through our Grammar classes. By that time we hope that our 9th graders will be able to read at a college level. This advanced reading ability will continue to be a blessing for them as they go to high school and post-high school diploma education.